The Alpha Performance Extreme Duty Pistons are not your ordinary replacement pistons. We teamed up with Manley Performance to engineer heavy-duty, yet lightweight pistons that are designed to increase power and perform flawlessly under extreme heat and PRESSURE. To improve the output of your VR38, we’ve raised the compression ratio to increase horsepower throughout the powerband. This increase also produces more low end torque which reduces turbo lag and improves boost response. Forged 2618 piston material to handle the stress of over 1800+HP! Offset wrist pins for quiet start-ups. Moly-Coated skirts reduce friction and prevent scuffing. Premium Steel 1.2mm top ring set with 1.2mm Napier second ring and 9-13lb tension 3mm oil ring included. 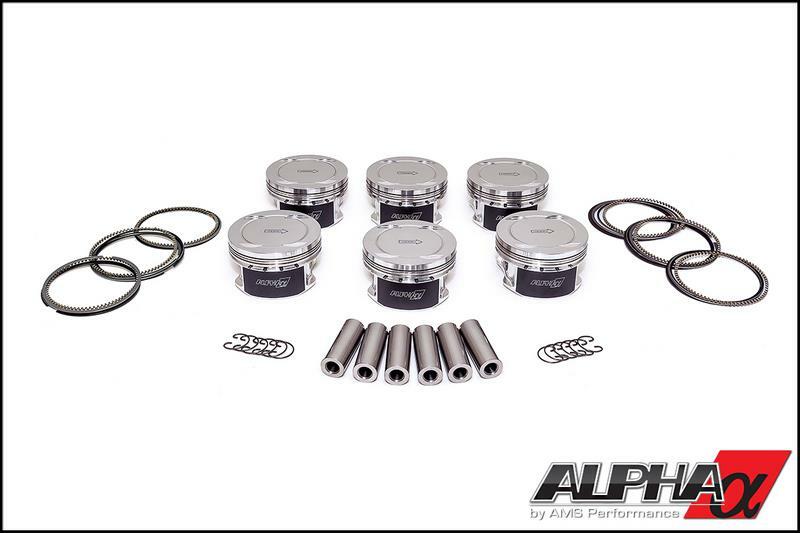 These pistons feature skirt diameters that correspond to the OEM Grade 1, 2 or 3 bores (see pic below). Check the bore grades on the back of your block and order the appropriate quantities of Grade 1, 2 or 3 pistons.